Upon arrival in Chamonix at the end of May I set out to find the endurance fiends in the valley. 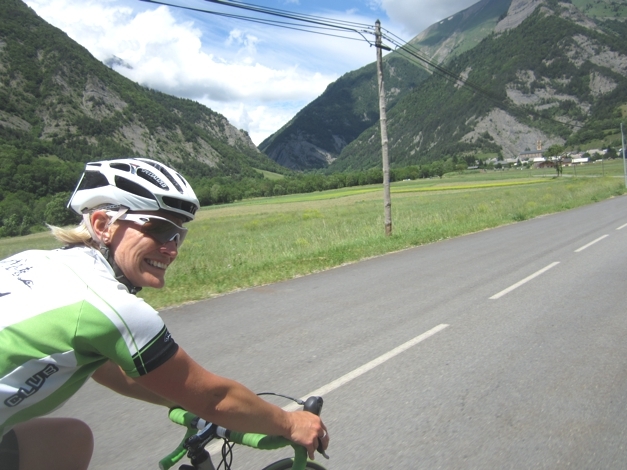 It didn't take me long to meet the Chamonix Alpine Endurance crew on facebook, order the club kit, receive the weekly emails and sign up to my first trip with them - Cycling Alpe D'Huez. Alpe D'Huez is one of the great climbs of the Alps made famous by featuring each year in the Tour de France and in the Alpe D'Huez Triathlon. We cycled the route of the long course triathlon - 115kms with 3500 metres of ascent. Featuring 3 big climbs each of 12kms, 20kms and Alpe D'huez itself is the pinnacle of the day, a 15kms climb with 1000m of ascent over 21 hairpins. Killer! Apparently I describe lots of things as 'a once in a lifetime opportunity' and this was definitely one of those. I figure it can't be a bad thing to look at opportunities that way. Of course I could go and cycle this route any day of the year, but being in Chamonix it was only a 3 hour drive to the route and I had the crew, transport already being offered by the lovely Liz who runs Blackrock Ski Lodge. The whole day cost me £30 including transport, food and drinks and it turns out, it was one of those days I will never forget. 8 of us had signed up for the ride and met at 5:30am in Chamonix. 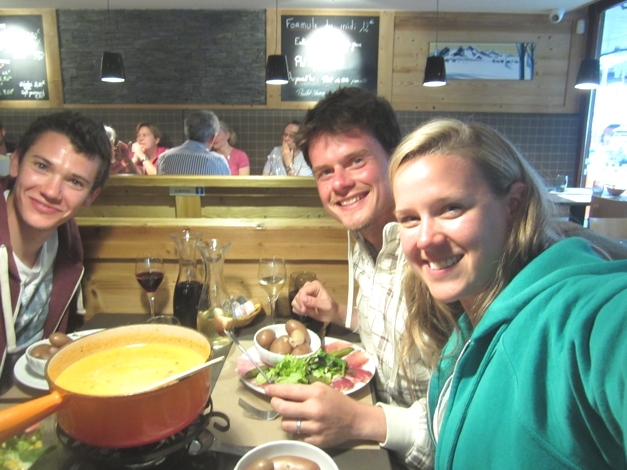 Having spent the previous two days up the mountain climbing with Charley and Will, we had been out celebrating our successful climb the night before with fondue and wine. Probably not the best nutrition for a big bike ride! Well, we have to live a little right? On the drive there, the atmosphere was buzzing with talk of all things endurance sport related. With less than 2 months to go until my first Ironman in Wales it was brilliant to find myself in the company of experiences triathletes who fed me tips and advice throughout the day. I keep hearing that consistency is king in IM training. I would describe my training as the opposite of that. Been building a solid endurance base though and days like this are instrumental. The moment we set off the scenery was stunning. We spent the next 7 hours cycling along roads carved through huge green valleys and mountains. We passed through sleepy French villages where locals enjoyed a weekend lunch in the sun. We crossed rivers, cycled through meadows and up mountains. When I wasn't listening to the screams of pain coming from my legs, the scenery and laid back feeling of the villages we passed through felt like a dream. Out of the 7 hours I spent on the bike, more than half were spent going uphill. My legs were knackered!!! One of the toughest rides I've done, but fantastic training and experience. I loved getting to know my new endurance buddies - it's something that always appeals to me about Chamonix, the density of like minded people to go on adventures with. This day lived up to all my expectations and more. Everyone in the club made me feel so welcome and happy to be there. Thanks to Emma and Jim for riding with me - company always makes it seem more manageable. By the time you get to this climb, you are well and truly warmed up and keen to see what all the fuss is about. My legs were ready for the final push and 21 hairpins. 21 they say... is a slight bend on the truth. It takes 2 hairpins before you get to the first one and after the final one I got to the top, saw some of the guys drinking beer in the sun only to find out there's another 1.5kms to go! Well, it's what you would expect from a mountain climb with this reputation and status. Lance Armstrong has done the climb in 45 minutes. It took me twice that time. I actually really enjoyed it, I relaxed into the climbing and took my time to enjoy the stunning views and imagine the atmosphere there during the Tour de France. At each hairpin names are written on the road to encourage and support team members, I imagined the streets lined with supporters all having fun and watching The Tour. The magic of doing the same ride as the participants of the Tour de France is impressive. Finally at the top, my legs were like blocks of wood and my body was craving sugar and salt. 1 packet of crisps, 1 snickers 1 can of coke were consumed rapidly and put energy back into me. The descent took 10 minutes. Fantastic day out on the bike with new friends. Going down in my books as one of those once in a lifetime opportunities. If anyone is tempted, go for it - comes highly recommended from moi.